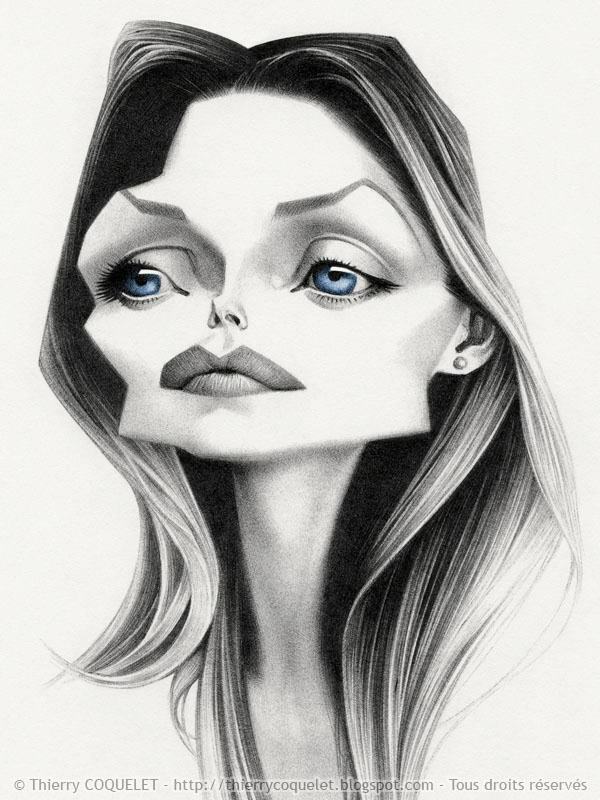 I asked artist Ugo Sajini some reflections on caricature art and about his approach. Here I publish integrally the text I received from him. per tramandare il proprio volto o la potenza propria o della propria genia, fino alla fotografia, la riproduzione perfetta di come sei ma non di COSA sei. Il cosa sei è stato sempre realizzato con la caricatura che per sua natura è riproduzione, analisi, critica, sfottò o addirittura presa per il c…Il modo più facile per riprodurti è farti un testone su un corpicino, possibilmente con tanti bei colori. Di solito questa tecnica è priva di analisi, dei tuoi difetti, del tuo carattere e di chi sei veramente, ma piace fa ridacchiare anche il riprodotto, oltre ai suoi amici e in un rapporto disegnatore pubblico è il meglio anche se si rischia di diventare un faccificio. L’analisi è l’anima della caricatura, l’esempio che tutti conosciamo è quello di Leonardo, volti che l’indagine fisiognomica esalta. Partiamo da Philippon e il suo re Luigi Filippo che diventa una pera. Anche un clima politico o una nazione si possono rappresentare allora ecco Grosz. In fretta arriviamo ai disegnatori di sintesi ad es. Garretto e Ardito e Gibo fra gli innumerevoli che hanno generato infiniti emuli consapevoli o finti inconsapevoli . Today we have the honor to present a long and exhaustive interview to Marzio by Writeca, an independent online source of art news, reviews, and information on the contemporary and old masters of the arts. We hope you enjoy it! It’s hard to believe it’s been such a long time since I last posted an interview on this blog. I’ve never gone that long without writing! The stuff of life and work just got to me. I couldn’t make the time and mental space to work on the blog. I had to do something to make it up to you. So here's the interview to Mac Garcia. Mac is a very young and talented artist from Texas. All his works show an amazing vibe and energy. 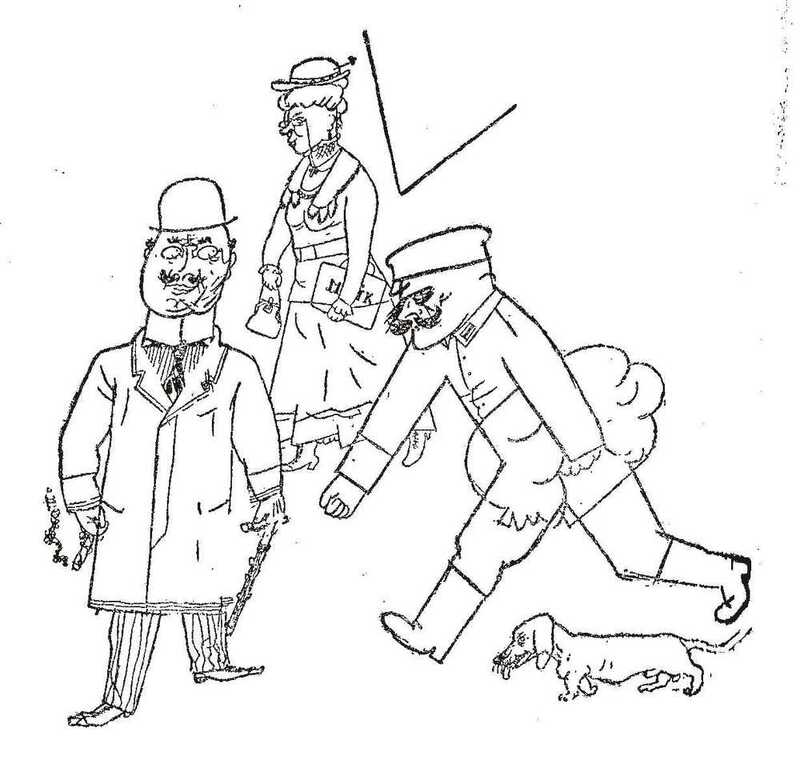 His caricatures are thoroughly-entertaining without ever giving up on likeness or quality. It's an honor for us to host Mac on our blog. Please take the time to visit his website www.macgarcia.com and facebook page. First I would like to thank you for doing these interviews as I believe it can strengthen and encourages many artists. To tell you a little about myself, I'm a Christian, I'm married and we have two young kids and when I’m not drawing I'm usually changing diapers, spanking or doing something with the church. 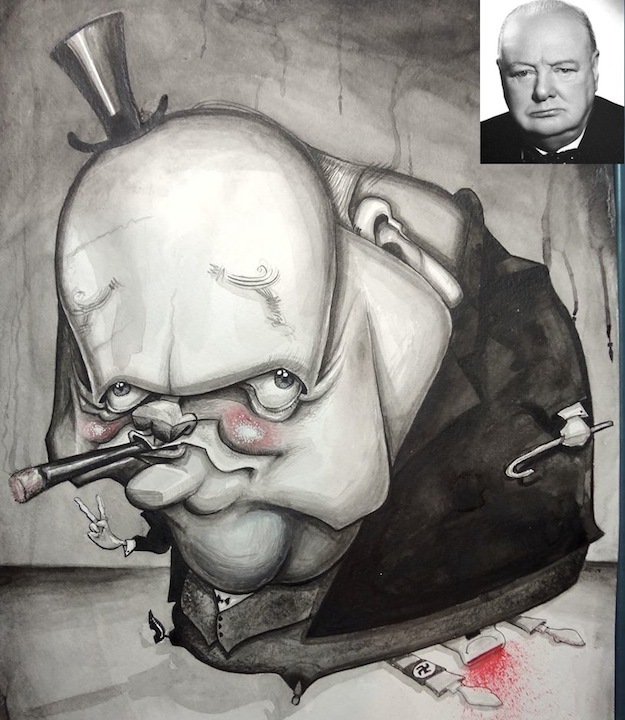 When and how did you come across the art of caricature? In High School my mother told me I needed to start working. And she forced me to apply at a theme park to do caricatures. I had no desire or interest in caricatures at all. We had season passes there as kids and would go quite regularly during the summer and I new of the caricature booths there but never stopped or cared for it. I loved to draw but I was more into realistic art. It took about two years until I fell in love with caricatures. Do you make a living as a caricaturist? Yes. I’ve been drawing caricatures full time for at least 10 years now. I love this one quote from Robert Henri where he said “I am interested in art as a means of living a life; not as a means of making a living.” I’m so very thankful that my wife and I and our 2 kids can live off caricatures but this is more of a hobby or passion for me. I mention this because in our country a lot of artists only draw caricatures to pay their bills. The thinking goes like this “There is no right or wrong way of drawing caricatures so likeness and exaggeration don’t really matter”. Their desire is to only get through their lines of customers so they can get their top sales award, and I’ve done this before. It’s my opinion that our ambition should always be focused on producing good art. When we put our bills or a top sales award in that spot then that’s when our growth and this art form for the future can take a tumble. 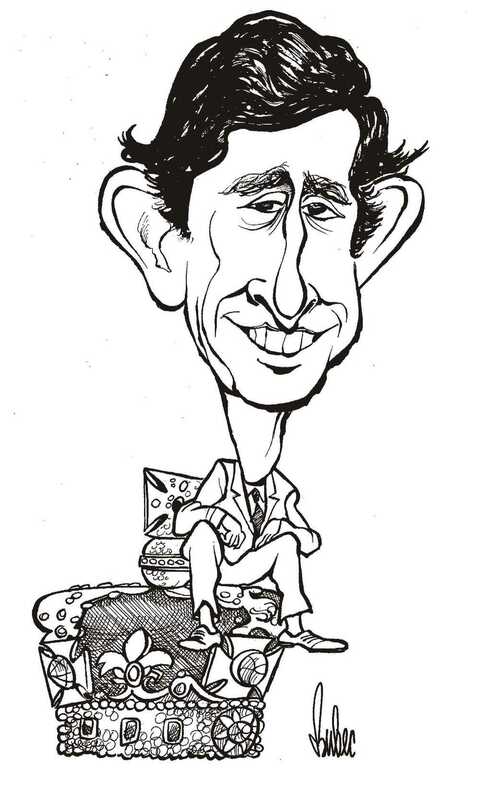 Do your caricatures get published in magazines newspapers or blogs? Not that I know of. Most of my works are done live at events and parties or here at my home studio. Are you in touch with the world of art galleries? Nope, never heard of “the world of art galleries”. Are you physically in touch with other colleagues? Yes I gather with a group in my city to train and practice. We meet at coffee shops and parks and practice on unsuspecting people. We share with each other what is going on in our minds and our thinking as we each draw the same person. Do you take part in gatherings, exhibitions, fairs, or guild/club? I’m a member of the ISCA and I attend their yearly conventions. It’s a lot of fun and has been a huge part of why I’ve grown in love with this art form within the past 3 years. Bruno Hamzaqgic, Nate Kap, Jim Maester, Ernesto Priego, Walter Toscano, Thierry Coquelet, Jan Op De Beeck and many others. A few hours a day I guess. I draw in the studio during the week and my computer is always on so I get to see a lot of other artists’ works. 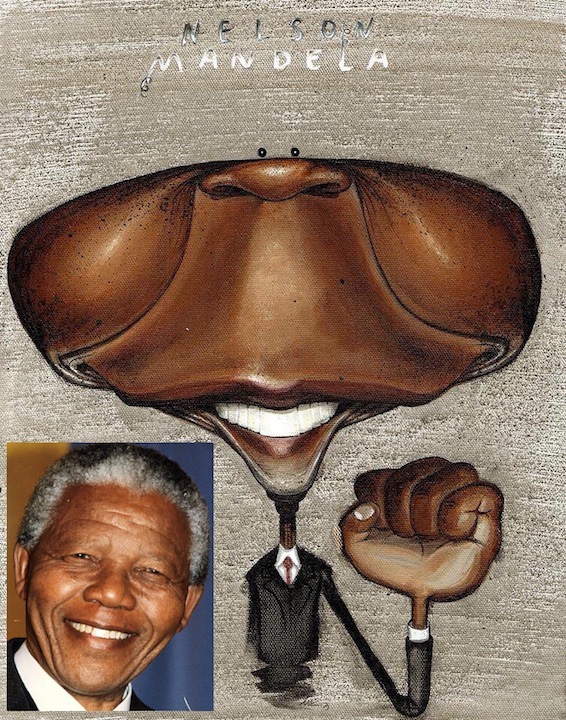 Can you tell us a little background on the group Traditional Caricature Contest. How it was started, who started it? And so on. Tell us about your experience in the group. A caricaturist named Tasiir Franz who has a strong passion for using traditional media started it. He wanted to create a group where photo manipulation programs and digital software weren't used in the creation of caricatures. It’s been a huge joy just getting to know and learn all the different approaches the artists take on a particular subject. It has been a huge inspiration for me. Can you tell us a little about your technique? Recently I have been using watercolours but I try to let the subject’s personality and energy determine the choice of medium and technique. What I don’t want is to have my entire world look the same or to have someone be able to tell that I was the artist. I’m not the best at it but I want the choice of technique and medium to all be pointing to the subject. Can you give some advice to young cartoonists? Know why you want to draw caricatures and draw, draw, draw! Make sure your thinking and motivation is right as you gain experience. Experience is good but only the right kind. There is a thinking, and this may only be in my city, that says success is determined by Top Sales, popularity, most Facebook likes, general publics approval & applause, tips, the longest line at a booth etc. Those things aren't wrong but it would be if I used those things to decide if I was a success or not. I believe success in caricatures is characterized by the artist’s ability to capture likeness through the means of exaggeration. And our motivations and goals should lean towards the art and not an economic gain. If someone can do that and do it well it doesn’t matter if they get a reject or make top sales at their booth, they have succeeded. I would consider an artist who was characterized by drawing rejects or if they did it only as a hobby without pay a success if they caricatured someone with perfect likeness using exaggerations. It all comes down to the quality of the work and the art spirit within an individual. Success is sticking close to the master caricaturists principals, motivations, teaching, encouragement and correction. Principals can change and grow into new ones but it’s done by artists and not the general public. The general public know very little about caricatures and if we use them to affirm or teach us we will all end up selling lies and not using exaggerations. Most of us know exaggerating and likeness is important but because of the pressures and fears we can sometimes not draw that person the way they really look and feel. “…but I made more tips than you and people like my stuff better”. “I don’t go to the ISCA conventions because when I see better works I feel discouraged”. “My customers approval is all I need for growth”. I would highly recommend a book called “The Mad Art of Caricature” by Tom Richmond. It’s the best book I have read that teaches the basic theories and principals of how to see people as caricatures. 13 - Do you have any hobbies or other passions? Yes, after I finish a caricature order or event I like drawing caricatures and when I’m tired of drawing I like to envision caricatures as I walk past people in stores and in the clouds as I’m driving or riding my bike. And when I get tiered of seeing caricatures in my wallpaper I take a break and draw caricature. This week we have the honor to host Thierry Coquelet for our interview series. We waited a little to ask Thierry for an interview just because he is not only a virtuoso and a talent but above all he is an incredible artist and one of the few who takes caricature portrait to a whole new level. We cannot help but to look up at his work in admiration. Thierry has it all, mastery, skill, sensibility, cleverness, genius. 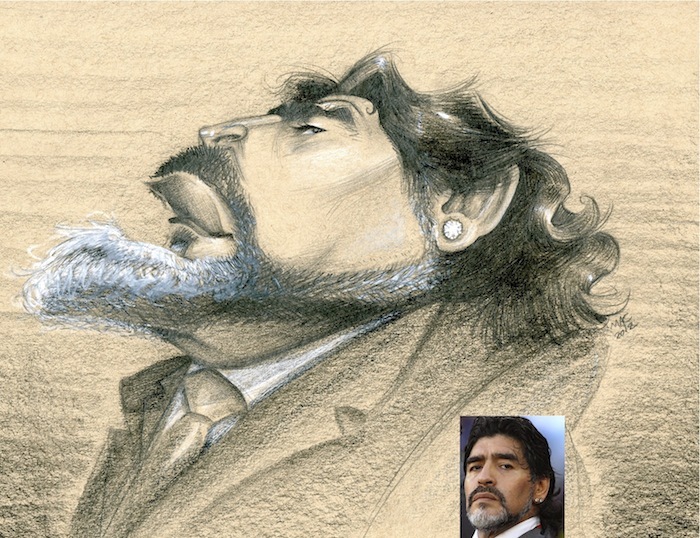 No wonder he is among the top winning artists in all caricature contests on facebook. So thank you Thierry for taking the time to answer our questions and share with us your thoughts and your experience. 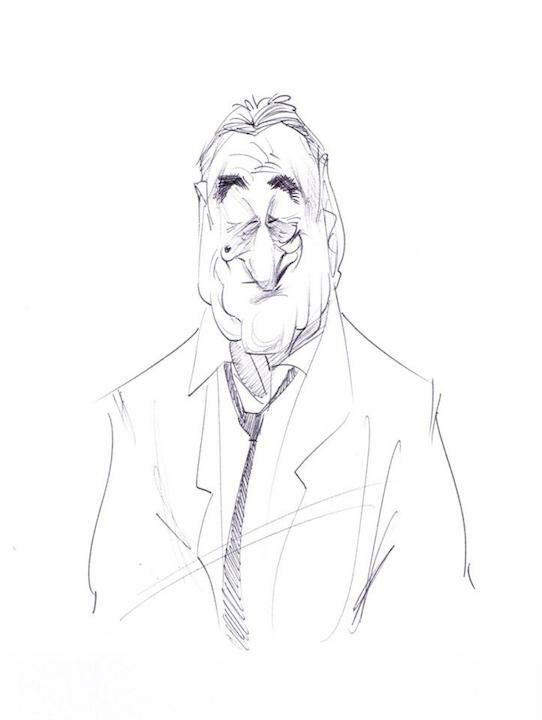 Then, a television program caused a fundamental click: it was “Tac-au-Tac” in which Jean Mulatier and Patrice Ricord drew a caricature of Leonid Brezhnev (http://www.ina.fr/video/CPA75051391). This show was a real revelation and the caricature itself a true sculpture. Gesture, energy, critical analysis, transition from photography to drawing, structure, etc... I had the impression I could understand everything. It was my first Master class. The drawing was not a mere entertainment : it was a real job. I am not a professional caricaturist. I have another job related to my studies in architecture. I always drew as an amateur during my spare time, and not caricatures only. I did illustrations, portraits, 3D modeling... and also some attempts into the world of comics to which I would like to come back one day. During these last years I drew much more caricatures, and because of that my schedule has also become much more complicated. But I would like drawing remains a pleasure above all. In any case, this allows me to choose my subjects. About thirty of my drawings (final drawings and sketches) were published in “Wanted! 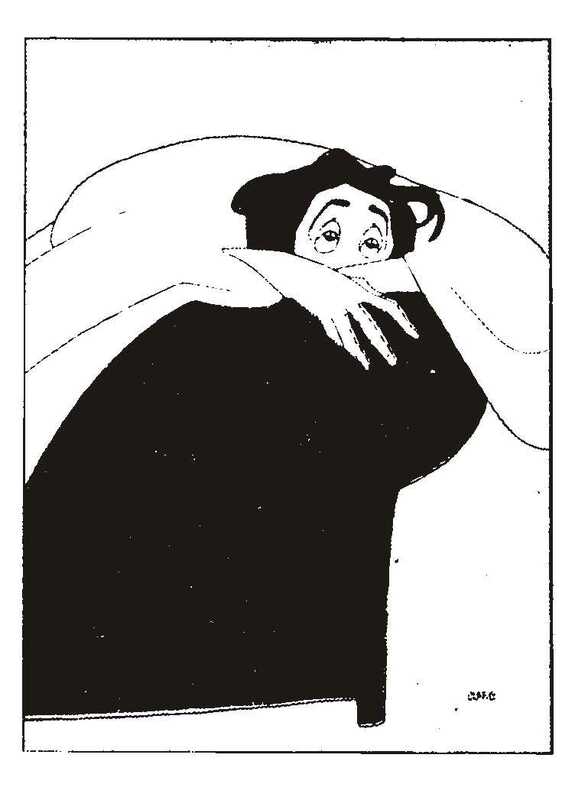 Caricature & Western” (Les Éditions Valentine Publisher), which was a fabulous collective experience initiated by Maëster. Two others, the first about Stendhal, the second about Gustave Flaubert, were placed in frontispiece of biographies dedicated to these French writers. As I said, I'm not professional and moreover I never had enough audacity to submit my work to publishers. Aside from that, I post my work regularly on Facebook and my blog. Not at all. The only time I saw my original works in public was in the exhibition “Wanted!” which accompanied us in various festivals we went to meet the public and sign the book. It's rather strange to see one's drawings in a frame and hung on a wall. It makes them oddly definitive and I'm not used of that. Are you physically in touch with other colleagues? Do you take part in gatherings, exhibitions, fairs, or guild/club? Because we generally all work alone in our studio, internet has been a wonderful tool for artists who wanted to share their work. This is a link that allows to track the work of each other in near real time. We can learn a lot by looking at colleagues' work all over the world. For this reason, I participate from time to time to some caricature contests on Facebook. But we also learn a lot by watching an artist who is drawing in the real life, by following each step of his work. This is why being physically in touch with other artists is very motivating. I understood that when I physically met artists I regularly visited blogs or Facebook pages. The collective adventure of “Wanted!”, with Maëster, Jean Mulatier, Achdé, Jean-Marc Borot, Thomas Lebeltel and Charles Da Costa was a particularly great learning experience for me. From August 27 to 30, 2014, I will attend the next EuroCature Convention in Vienna where, in addition to meeting talented artists and drawing together, I'll have the honor to participate as a guest speaker with Paul Moyse and Court Jones. There are really a lot of artists I admire. However, Jean Mulatier and Maëster have always been very important for me, because their art gave me absolutely everything I can do today on caricatures, and their work inspired me ever since I discovered them. Their technical approach to caricature is very different, but their art is so powerfully positive that it illuminates beyond their works. They are part of the very few artists whose works appear so alive, with a true soul. Each piece of their work demonstrates with an incredible grace that caricature is not just an approach of volumes, superficial shadows and light, but it can reveal an infinite depth. I admire these two masters a lot, and they gave me the chance to work with them... What could be better ? The contests on Facebook in which I participate, and blogs I visit, obviously affect my approach of caricature. Being curious about colleagues' works allows not only to continue learning with fun, but it also leads to raise our own requirement level and try to explore other modes of expression. I don't know how much time I spend on the web in my spare time, but it is probably too much. In any case, it's even less time devoted to the practice of drawing itself. The choice between drawing and learning is sometimes difficult to make. What people remember of my drawings is the cross-hatching technique with a ballpoint pen or a pencil. It is true that the ballpoint pen is a very demanding tool because it takes a lot of patience to control it completely, and in most of the cases it is impossible to rub the ink out. The ballpoint pen I use allows to draw very thin lines, which supposes that the hatching takes a lot of time, especially when you have to overlay many layers of cross-hatching in order to get a deep black. And the cross-hatching itself must be as soft as possible not to dig or to engrave the paper. In that way, some caricatures may occupy me for several days. This is the reason why my drawings are rather small. Many of them would fit on an A5 format. Sometimes I paint digital caricatures from a sketch previously drawn on paper. I prefer the traditional technique because the pencil's caress on paper seems to me much more pleasant and sensual than the plastic friction of the stylus on the tablet, but digital art allows to work greatly faster than my traditional technique. With a tablet, I can obviously do much more work in one day than what I would do in three days with traditional tools such I use them. And I don't know any publisher or any editor-in-chief today who would pay an artist with his pencils for three days if the same work can be done in one day only by someone else using digital technology. To be totally objective, I should say that my cross-hatching technique is in question today much more than traditional tools. Maybe I'm wrong but, honestly, I often feel quite alone with that technique... That must mean something. As an amateur, I don't feel particularly legitimate for giving any advice. However, I can share feelings, experience or impressions related to the practice of drawing. Drawing means forcing oneself to watch and try to understand. This would be a good goal in life, isn't it? Do you have any hobbies or other passions? I like movies, comics, architecture and urbanism, set designing, art history, reading.